The occasion of Gurpurab is very special for the Sikh communities. This marvelous fiesta is celebrated on the auspicious birthday of Guru Nanak Sahib, the founder of Sikhism. The three days long festival attracts many from faraway places on the premise of Rai-Bhoi-di-Talwadi, the birth place of Guru Nanak Sahib. The peaceful and non violent messages of the calm Sikh Guru have a huge impact on the revelers and believers of Sikhism. The doctrines and Sikh philosophies are widely spread and followed by innumerable Sikhs all over the world. Go through the overview of Gurpurab and the process of celebrations to know more about the fascinating Sikh festival. Think and try to answer the questions of the quiz. Fabulous wallpapers of this section will entertain you as well. Don’t forget to Refer this page to your friends and relatives if you find this page informative and interesting one. Know and learn about the sikh festival Gurpurab celebration. A brief account of Gurpurab Festival, one of the important and foremost Sikh festivals. Tickle your grey cels with wonderful quiz made to mark the occassion. 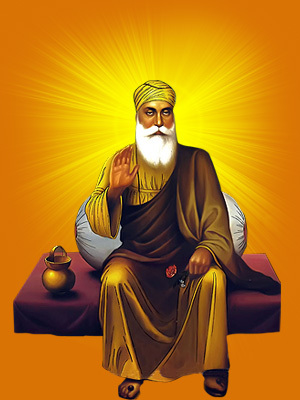 Adorn your desktop with these wonderfully made Gurpurab Wallpapers.